Don't know if this has been answered but yes, the Lambs Club still survives. It is at the Dennison Ohio Railroad Museum. Thanks, Matt, for the info! Hmm, did a quick search and couldn't find anything. I haven't been assigning line item numbers to the several surviving all-wood or wood-and-steel-composite cars which have come up in this thread, but of course I'll make some inquiries as to what car this is. Ted, if it is helpful, here is a link to a photo of this car. And I stand corrected for calling it a Wood car as it certainly appears to be a steel car. Hmm...interesting...it could be an all-steel car or a wood car later rebuilt with steel sheathing. I see in the photo that they claim it was built in 1898, but I've learned to take claimed dates with a grain of salt until the history is confirmed (like when it's claimed a car was used by a specific President). Click forward about four photos. The raised panel interior, and the amount of carving, would seem to indicate a steel sheathed wood car. The wood interiors in steel cars were typically much plainer. A delayed "update"; as posted in late November in the Pullman group by Nick Nichols and John Suscheck, this is a former Great Western business car, and I quote: "Interior gutted except kitchen and gaudy wood victorian interior installed"
This was among the MILW and SOO equipment privately owned in Rockford, IL, at least some of which ended up being moved to the Colfax RR Museum. I have been in the car - it is a kitbashed Pullman converted to MofW service with a new end fabricated at Milwaukee Shops using the 1934-pattern streamlined coach design. This appears to be most of an old 10-1-(-) sleeping car, and a short piece of a lightweight, open-platform branch line combine. The combos were built at the Milwaukee shops (in Milwaukee) in the mid-1930s. This bizarre mating must have been done in the 50s/60s, when combines for mixed trains were no longer in demand. The Milwaukee Road acquired at the 12/31/1948 Pullman divestiture a total of 14 sleepers of the 10S-1DR-1C configuration (all from Lot #6043, to Plan #3973C, and all painted "MILW Std."). Just for reference, there were a total of 30 10-1-1 sleepers built in Lot #6043, all originally for service on the Milwaukee Road; 14 of the other 16 cars were sold to: ACL (1), C&O (2), ERIE (5), NYC (4), and UP (2). The 2 remaining cars remained in Pullman ownership until listed as sold to scrap dealers. As for the 14 cars acquired by MILW, most did not last long in Pullman lease, with 12 withdrawn between January and April 1949. The 2 remaining cars, Big Rock and Des Moines, were also withdrawn at that time, but re-entered Pullman lease in April 1955, withdrawn again in May 1956, and the Big Rock was again in Pullman lease from September 1956 to September 1958. What I don't have is more info on the disposition of Milwaukee's heavyweight cars, including sleepers, so pinning down the history of this car shall remain open ended. Also, was this car among the Rockville equipment acquired by Colfax, or was it ultimately scrapped? Unfortunately, I'm not aware of any photos of the car in question. 396. MILW baggage-express #2051 is owned by the Milwaukee Road Heritage Center in Montevideo, MN. Does anybody know what sleeper the #2051 was converted from? Thanks in advance! When the rest of the equipment was moved out, that car was scrapped. This info came from the owner. The 3 lightweight cars that were in Rockford with x-595 survived. One went to Colfax, WI and the other two were moved to the owners property outside Rockford. I recently acquired a slide of the MILW #X-595. Looks like the only thing replaced was the roof on about one quarter of the car; the rest, including trucks, windows, sheathing, and vestibule steps, were left as-is. A car has popped up for sale on Ozark Mountain, according to the listing its a car named "Perry". The photo shows it as AT&SF MOW sleeper #199813 (I think). So presumably another, much modified, 12-1 car still exists. 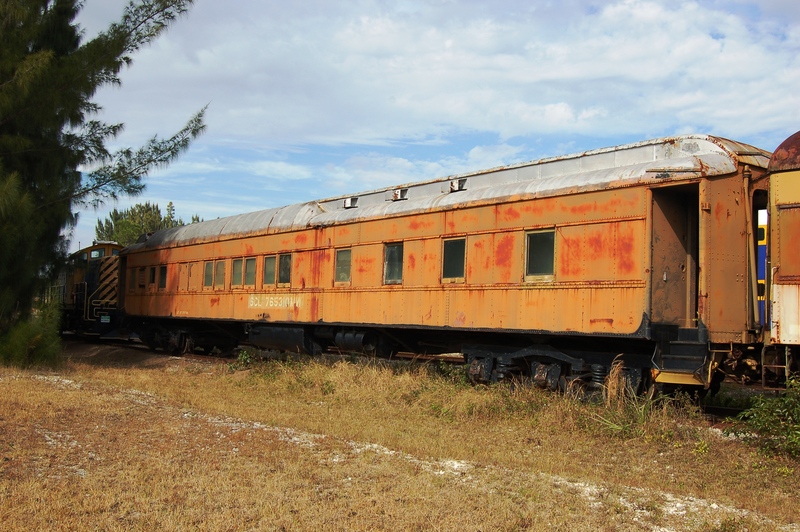 I don’t know if this one has popped up yet, but what about the Pullman sleeper that Rapido Trains is restoring? I don’t know much about Pullman cars, but is that car a heavyweight? Also I believe that the RRMPA has a Pullman heavyweight. The car that Rapido Trains has preserved is not a heavyweight. It is the former Canadian National/Via sleeping car "Edmundston" built by Pullman in 1954. It contains 4 Sections, 8 Duplex Roomettes, and 4 Double Bedrooms. The firm also has an RDC-1 and a "new look" GM city bus. Lot 4816 Plan 3521 Mt. Sheridan which went to the Cotton Belt (SSW). It was then an instruction car, then went the Spaghetti Warehouse in Little Rock, then went to the White River Scenic, and is now at the Durbin & Greenbrier Valley as car WVC 120. "Also I believe that the RRMPA has a Pullman heavyweight." That's the Lotos Club which is already covered on this thread. 288. The West Virginia Central owns a Plan #3521 10S-lng-obs (as #120) whose identity remains unknown. The WVC website says it was formerly owned by the White River Scenic (WRSR), which was formerly SP business car #110 Los Angeles. This is not the case, as this linked thread discusses: http://www.rypn.org/forums/viewtopic.php?f=1&t=31717. Does anyone know the identity of this car?? Ah ha, another mystery solved! Oops... my bad... it should be a 10 Sectiion - 1 Drawing Room - 2 Comp car. As for these cars' histories they are either SAL 1251 Lake Alexander or 1250 Lake Borgne, the other two cars acquired from Pullman are listed as scrapped. Thanks, Jerry, for the info on Bonsall, Lake Alexander, and Lake Borgne! SAL acquired Lake Alexander, Lake Borgne, and Lake Chicot. ACL acquired Lake Cone (renamed Puerto Rico in 1938), Lake Elmo, Lake Louise, Lake Pelican, and Lake Winnebago. Which two cars are shown in the records as being scrapped, and what were the dispositions of the other four? Lake Alexander was removed from Pullman lease in January 1963 while Lake Borgne remained in Pullman lease until November 1964. No further disposition is mentioned, which is why I believe that these were the two cars that saw use in MofW service. Lake Minnetonka was wrecked on the Seaboard in December 1953 while Lake Chicot remained in Pullman lease until February 1965, after which the car is listed as being scrapped. ACL acquired Puerto Rico, Lake Elmo, Lake Louise, Lake Pelican, and Lake Winnebago. Lake Elmo was withdrawn from Pullman lease in November 1964 and scrapped, Lake Louise was withdrawn in August 1956 and scrapped, Lake Pelican became ACL coach 900 sometime after its withdrawl from Pullman lease in December 1959 (no further disposition info), Lake Winnebago was withdrawn in May 1960 and scrapped, and Puerto Rico was withdrawn in July 1960 and scrapped. Beacon Hill (Lot #6035, Plan #3961A/D/F, 1927, plr -buf-lng obs , ex-Florence Nightingale, B&A/20th Century Limited)--sold to PRR #7031 (1945) to buffet-bar (club) #1118 (1956) to "The Rail" ice cream parlor (Hudson, OH) (unknown date) scrapped in late 70's or early 80's. Copps Hill (Lot #4910, Plan #3961/G, 1925, plr -buf-lng obs , ex-Princess Adelaide, WAB/Banner Limited)--sold to PRR #7032 (1945) to buffet-bar (club) #1119 (1956) to "The Rail" ice cream parlor (Hudson, OH) (unknown date) scrapped in late 70's or early 80's. Was reported that this car was scrapped last year. It was also reported that this car was scrapped, in 2017. Also not a surviving car, but just cross-referencing it here. There have been several threads that have mentioned this car, and also mentioned was another car, a "heavyweight observation" (perhaps another Plan #2521/#3521 car?) that was once owned by Bill Hale and was later resold to Shortline Enterprises; that mystery car had formerly been located in Mobile, AL. Anyone have further info on this other car? Thanks in advance.